The Power Of Poison Is On Full Display With 30th Anniversary 180-Gram Red-Vinyl Reissue Of OPEN UP AND SAY…AHH! Capitol/UMe is poised to celebrate the 30th anniversary of Poison's best-selling album, 1988's five-times-platinum "Open Up And Say… Ahh!," with a sensationally reproduced 180-gram reissue. The LP was pressed in two collectible color variants: red vinyl (available at select retailers) and a limited edition of 1,000 in green vinyl (available exclusively at The Sound Of Vinyl). Order Poison's "Open Up And Say… Ahh!" ume.lnk.to. This exciting LP reissue also restores the album's original full-frame cover art, which initially featured a glammed-up cat person's elongated tongue extending fully down the middle of the cover image, ultimately protruding between the last two words of the album title that had been scrawled across the bottom. Yet back in the day, "Open Up And Say… Ahh!" was instead issued with a tighter, widescreen, mostly green-eyes-only view amidst a black background. Originally released on May 3, 1988, "Open Up And Say… Ahh!" cemented Poison's status as one of the biggest bands of the 1980s, in turn garnering four Top 20 hits and including their first No. 1 single, "Every Rose Has Its Thorn." Produced by Tom Werman (Cheap Trick, Ted Nugent, Twisted Sister), engineered by Duane Baron, and recorded at Conway Recording Studios in Los Angeles, "Open Up And Say… Ahh!" 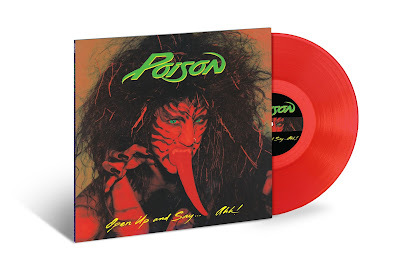 sealed Poison's standing in the rock pantheon with ten tracks chock-full of instantly singable choruses mixed with fist-pumping riffs, courtesy of the four-man-band chemistry between vocalist/rhythm guitarist Bret Michaels, lead guitarist C.C. DeVille, bassist Bobby Dall, and drummer Rikki Rockett. The acoustic-driven universal lover's lament "Every Rose Has Its Thorn" reached No. 1 in December 1988, and fans of the cult-favorite 1991 film Bill & Ted's Bogus Journey will recall the power ballad's ubiquitous chorus as being the answer to the eternal question, "What is the meaning of life?" The album's other big singles include the ever-anthemic and always energetic "Nothin' But A Good Time," the wide-eyed dreamer's warning of "Fallen Angel," and a raucous cover of the 1972 Loggins and Messina hit, "Your Mama Don't Dance." These days, Poison remains a consistently powerful concert draw, as this summer sees them heading out on their Nothin' But A Good Time Tour 2018, with special guests Cheap Trick and Pop Evil. And just like every cowboy, you can join in and sing along with the undeniably catchy energy of Open Up And Say… Ahh!